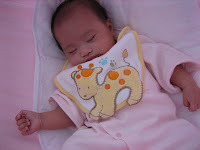 I just love it when my baby Samantha sleeps. She just looks so peaceful and innocent and tranquil. I love the sound of her soft snoring. I love how she sleeps on her stomach and how she could get into different odd positions while she is in deep slumber. Shush! My sweet little sleeping child. I love how she can easily sleep in anything mobile: the taxi, the car, even her stroller. Odd positions are her favorite. Front, side, and back. She can do them all! I also love-hate how she fights off her sleepiness and how she would get out of our bed on one side and then climb up again on the other side for many times on end until sleep finally takes over and she would doze off on her rubber mats. I love how she would sing herself off to sleep each time I don't sing to her. I even love the duets that we have on most nights. And I love it when she would suddenly sit upright in bed while she's sleeping, looks around in a manner a drunk person would, and then lie back down again to continue sleeping. She is just so cute! I love it that she co-beds with us. And I will cherish these days until she is old enough to sleep on her own. Join us every Friday at Mommy Moments here. whew…look at her so cute! I dnt have such pics hehheh ….i love it! youre really right about fighting off sleepiness….my daughter is like that now. She 3 years old and so active! Aww… she’s so adorable. I love the different positions. hehe. yes, my little toby also does that drunk look, sits up and lays down again. really cute! you are correct, lets enjoy it while we co-sleep with them.. since one day, they will be big enough and wouldn’t want us to be beside them anymore. How I misses to have a cute baby like yours…Hope to have a baby boy next year! So many cute pictures of your daughter here. It’s nice that you were able to capture her sleeping moments in photos. I only have a few shots of my son sleeping. Please see my entry, too, if you have time. I hope we can also exchange links. oh the first photo is so lovely.. I love your Sleeping Time entry.. touchy and full of love..
aaghhh! ang cute ni baby Sam! I love the pouting lips ha…Nice to see back and rollin’ Kamz! so cute to know that she’ll sing for herself to sleep…he..he..love also to experience that moment that i could sing a song with my son…she’s adorable! wow! you really enjoyed taking pictures of your baby while she’s sleeping. nice to look at.